You’ve read the book now get the 2 disc set DVD. Filmed in USA, but translated into Aussie, there are 50 styles of quilting to take you way beyond missionary stippling and spice things up in your sewing room. 50 different free-motion quilting styles to watch and practise with me. Everything from Daisy Chains to Spider Webs, Fireballs and Wonky Spirals, Jigsaw Puzzles, Spirit Dancers, Steam Punk, Love Triangles and Easy Peasy Feathers,…..count them, all 50! I explain and demonstrate them all with humour and a relaxed Aussie style. 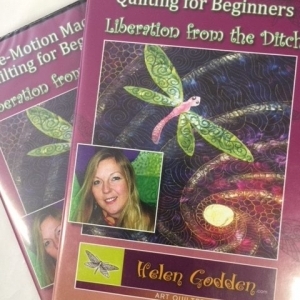 If you enjoyed my beginners DVD “Liberation From the Ditch” you are ready for more.